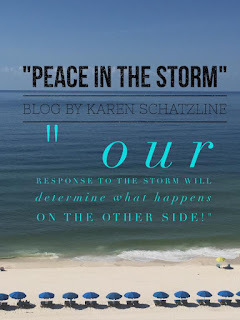 Karen Schatzline: "Peace in the Storm"
If you are in a storm, READ THIS! Have you ever longed for peace? Searched for joy? One of my favorite places is sitting on the balcony during our family beach vacation. I am always mesmerized by the ocean crashing against the shore. I have said on numerous occasions that this is my happy place. As I look across the beautiful methodical movements in this massive body of water, I know that the seas are not always so calm. Storms WILL come and disrupt the peaceful scenery before me. I am reminded of Mark 4:35-5:20, when Jesus and His disciples got in a boat to cross over to the other side of the shore. Once in the boat and on their way, Jesus laid down to rest while a storm arose and began to rock the boat. His disciples became afraid and worried for their safety and their lives. I have to admit, I find some comfort in knowing I'm not the only one who, on occasion, worries and frets in the midst of the storm. However, this time as I read over this scripture, the response from Jesus, took on a whole new meaning to me, as if the light just came on. It occurred to me that, we as Christians, walk with Jesus on a daily basis. We talk with Him, experience His power and might and love and grace and freedom. However, when storms come or the boat gets rocked a bit, our first response is to fret and worry and doubt. Jesus was in the boat. Just like the disciples, we immediately move into panic mode as if we have to WAKE Jesus up in our lives in order to be rescued. 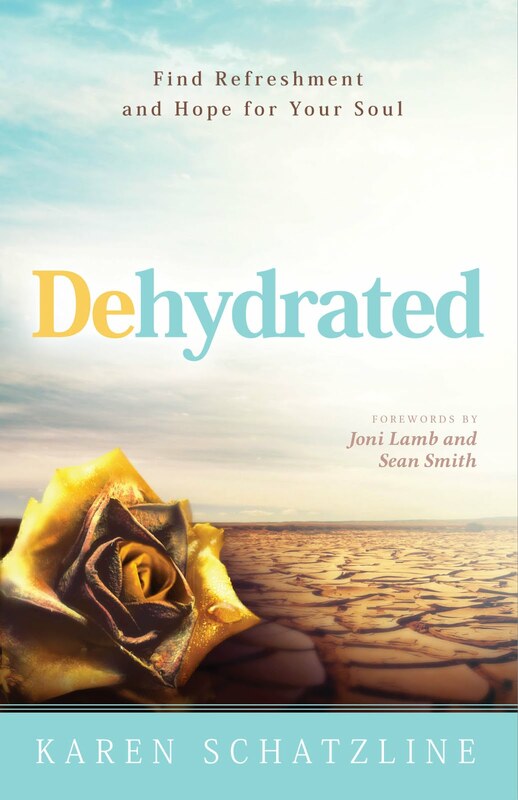 We proclaim, "Don't you care if we perish?" All the while Jesus is with us and hasn’t changed. I love what Jesus did in response to the disciples question. He got up, turned to the storm and rebuked it and said, "Quiet! Be Still!" And it obeyed and calmed. Then, He turned to the disciples and asked, “why are you afraid?" "Do you still have no faith?". This seems so odd because our natural response is to be afraid in the storm, but Jesus has authority over the storm! I believe Jesus was showing us something so powerful at that moment. I believe He was showing the disciples that they have been given authority over the storms in their lives. That even in the midst of chaos, turmoil, fear, and disaster, there is a place called peace that we can reside when we understand that Jesus is in our boat. 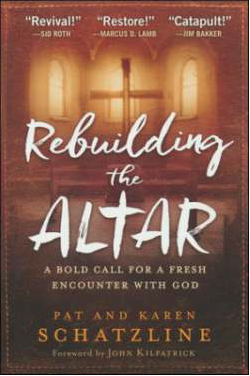 When Jesus rebuked the wind and the waves, there was a bigger picture at play that He wanted the disciples to see. Romans 14:17 reminds us, “The Kingdom of God is righteousness, peace and joy in the Holy Spirit”. So here's what He did. He declared "peace!" and "calm!" Not only to the wind and waves but across the waters all the way to the shore, where there was a man who was demon possessed and living in utter torment. A man who had no righteousness, peace or joy. He lived in inner turmoil and chaos day and night. Jesus wanted to demonstrate that His very presence in our lives can bring that order and unity in our lives. The peace that was declared caused a chain reaction to where it demanded a response. Not only did the elements of nature come into submission to the voice of the one who created it, but on the other side of the storm there was freedom in progress. 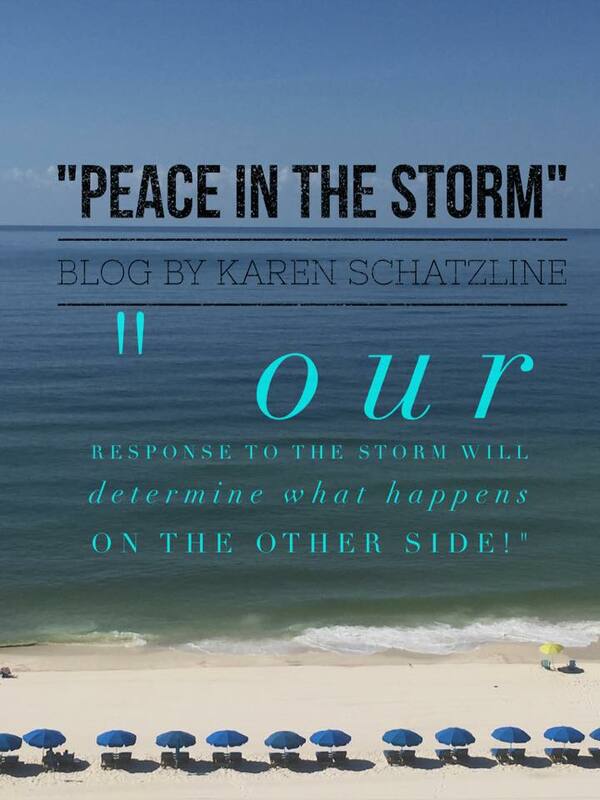 Our response to the storm will determine what happens on the other side. Jesus didn't just rebuke the wind and the waves but rather the outcome of the storm. So many times we get so focused on the storm, we don't see that there will be an aftermath to that storm. Matthew 6:33 says, "But seek first His kingdom and His righteousness, and all these things will be given to you as well." The very declaration of peace caused the storm in the demon possessed mans life to submit and fall at the feet of Jesus when He arrived on the other side of the storm. Are you seeing this?! Jesus' very presence in the storm stirred up the desire for righteousness in that man's life and as a result he was set free and he was brought into a place of PEACE and JOY. We know this because the Bible says that when the people came out to see what had happened, they saw the man who HAD BEEN demon possessed, sitting there dressed and in his right mind (peace). Then Jesus told the man to go and share what had happen to him with his family so that his family would be restored (Joy). 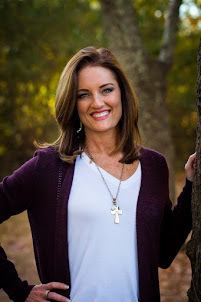 What I have learned is that, while storms are inevitable, and circumstances are at times out of my control, I can walk in peace and joy at all times when I understand true righteousness and faith in Jesus being in my life. The dictionary describes faith as this, "complete trust or confidence in someone or something". The question we have to ask ourselves is this, "do we completely trust God in all things?" I know I trust Him when life is going great, or am I really just trusting myself? To fully trust God is to submit and walk in obedience during the great and during the not so great. Seek first God's kingdom and righteousness and peace and joy will be your constant companion. On the boat with His disciples, Jesus was speaking peace to the very spirit of man. He clarified this again when He said in John 14:27, "Peace I leave with you; my peace I give you. I do not give to you as the world gives. Do not let your hearts be troubled and do not be afraid." Our response to fear needs to change, and as a result, the aftermath will be one that brings freedom. We are called to walk in daily peace no matter the circumstances or situation. Peace is not an emotion but rather a place in Jesus that our spirits reside. Today if you are walking thru a storm, then I encourage you to get up and see Jesus in the storm with you and speak God’s truth and His words and declare "Peace!, Be still!" Allow the authority that Christ has given you to defeat the plans of the enemy in your life and cross over to the other side into freedom! Learn how to worship where you should have died to get to the other side! Isaiah 26:3 says, "You will keep in perfect peace those whose minds are steadfast, because they trust in you." The storm is not the problem. It stirs our faith to then respond and activate our faith and trust in the almighty God to experience peace and joy like we've never seen before. What you call a tombstone, God calls a mile marker! Life is a great big adventure with God, embrace the journey!